How Can I Tell If My Car is Flex-Fuel Capable? You are here: Home / Car Tips / How Can I Tell If My Car is Flex-Fuel Capable? Cars that are flex fuel capable are vehicles that can run on either straight gasoline or an ethanol blend. An ethanol blend is fuel that consists of up to 85 percent ethanol and 15 percent gasoline, or what most of us know as E85 fuel. Not all cars are flex fuel capable and some owners may be surprised to know that they own such a vehicle. If you are not sure whether you drive an FFV, there are five ways to confirm this. 1. Inspect you gas cap. 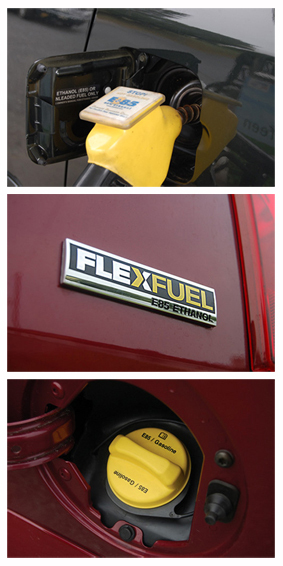 Most car manufacturers of flex-fuel vehicles use yellow gas caps on FFV models. GM initiated this practice in 2006 and other manufacturers have been following suit since 2008. In addition to the yellow cap, you may see E85 / Gasoline printed on the surface of the cap. 2. Check out the fuel door. Pop open the fuel door of your vehicle and you may seen a label identifying what types of fuel your car can take. If you see “E85,” then your car is flex-fuel capable. With some cars the label may be on the outside surface of the door. 3. Look at the body. Manufacturers typically like to boast that a car is flex-fuel capable. You may find various badges on the side and rear of the vehicle with designations such as “FFV,” “FlexFuel,” and “E85 Ethanol” present. FFVs have been around since the early 1990s — some older vehicles may not have badges present. 4. Open your owner’s manual. If you are not familiar with your owner’s manual, then sit down and open it up. Find the section that talks about fuel. If your car is an FFV it will note this as it mentions the different types of fuel your car takes such as regular grade gasoline and E85. 5. Check the Vehicle Identification Number. Yes, that 17-character alphanumeric sequence found on your dashboard and other areas of your car can tell you whether you own an FFV or not. Thanks to the great work of the North Carolina Solar Center, that information can be deciphered. Most FFVs have a special 8th VIN character designation that confirms this information, but sometimes another character is used. Check out the NC page to learn about your car. Cars that are fueled with E85 enjoy a slight boost in performance. However, your fuel mileage will drop by about 25 to 30 percent, a reduction that is not always offset by a similar lower price. E85 pumps are sometimes difficult to find too with greater concentrations in the midwest and other corn-growing regions of the country.